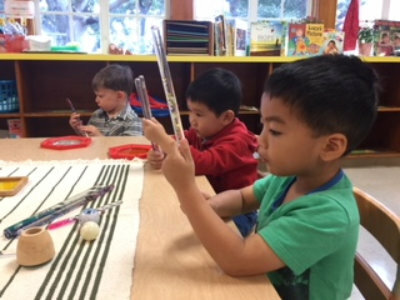 As a part of the Educational and Spiritual Development Committee of the San Marino Community Church and under the direction of the Nursery School Board, the mission of the Nursery School is to provide a Christian atmosphere that offers young children the opportunity to learn through Developmentally Appropriate Practice. The Nursery School welcomes a diverse population of families and gives each family the opportunity to be involved in their child’s early childhood education. The Director, teachers and families work together to provide the desired outcomes for all children enrolled. How we live out our mission-Here at San Marino Community Church Nursery School, we believe in the central importance of a child’s social/emotional growth. The planning for our classrooms always reflects this priority. Children are encouraged to learn to identify and express emotions. When helping children with conflict resolution, teachers model a non-judgmental, problem-solving approach. Our philosophy is based on what is developmentally appropriate for each individual child. Respect for self and for others is an enduring goal. Children between the ages of two and a half to five learn through active play: exploring their environment and interacting with others. Through play, discovery, and many rich experiences in art, music, math, natural science, and literature, children learn to understand themselves and to communicate effectively and respectfully with others.